Warm welcome to Anatoly at Julia’sFairies!! Same solutions, when interchanged mates the other King ! Funny problem ! It may be new. But is it interesting or paradoxical ….. would have been if it was helpmate problem. 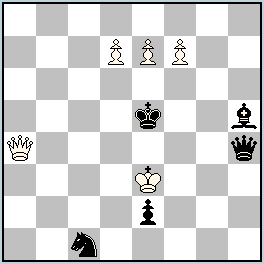 Here (like in any direct selfmate), the moves in the black phase do what they do in the white phase, which is to guard the black and white king. So no paradox.